Pearce was one of the most inquisitive and ambitious of the expatriate American painters in Europe in his day, at various times experimenting with realism, neo-grec historicism, Orientalism (both modern and biblical), plein-air naturalism, Japonism, impressionism, symbolism, and pointillism. Pearce’s blend of the exotic and the popular led him to become a sought after artist in both Europe and America, perpetuating the interest in Orientalist aesthetics, among many other preoccupations, as well as the search for newer styles and iconography strongly influenced by what was shown at the public Salon exhibitions. Charles Sprague Pearce was born on October 13, 1851 to a wealthy Bostonian family. From an early age he was immersed in a setting which nurtured his appreciation of the arts - his parents played the piano and the violin, and his father was a dealer of Chinese porcelains. Pearce’s father must have been keenly aware of the increasing fervor with which collectors began to seek these exotic works which also suggests his understanding of the artistic trends of the period. This was Pearce’s first introduction to objects that would later influence much of his work at his mid-career. Before he could experiment with artistic innovations, however, he was enrolled in the Brimmer School and subsequently the prestigious Boston Latin School where he showed his first artistic talent. After completing his schooling, Pearce worked with his father at his Chinese import business, Shadrach H. Pearce and Co., for five years, but soon recognized that he wanted to pursue a career as an artist, leaving for Paris in August of 1873. After his arrival in Paris, Pearce enrolled in the atelier of Léon Bonnat, a leading academic painter who had attained a high degree of prestige with genre scenes, history paintings, and portraits, and who also had his own atelier for students. During his career Pearce would generally follow these same categories of painting, initially concentrating on history paintings which were often Biblical in orientation, secondly completing portraits and, during the latter part of his career, completing numerous genre scenes. His earliest works, however, were inspired from his ambitious travels and often show a strong influence of Bonnat in the modeling of the subject and treatment of light and shadow. Towards the latter part of the 1873 Pearce and the American Frederic Arthur Bridgman, also from Bonnat’s atelier, left for Egypt and spent three months traveling down the Nile, amassing a wealth of drawings and immersing themselves in a culture that was unfamiliar to their own. This was a spontaneous journey necessitated by the fact that Pearce had contracted consumption; Pearce was traveling in Egypt in an attempt to cure himself with the warmer weather. Pearce must also have had other motivations to travel to Egypt, one of them being that the exotic East had been attracting artists and had inspired the use of Orientalist themes in many of the works at the Salon. Paintings by Gérôme, Eugène Fromentin, and Eugène Delacroix portrayed, in many cases with an almost photographic verisimilitude, revealed the customs, dress, and landscape of Eastern countries. The following year Pearce left Paris once again, this time traveling to Algeria where he spent the winter months absorbing the life and culture of yet another foreign country, further adding to his repertoire of Oriental themes. After returning to Paris in 1874, Pearce made his Salon debut in 1876 with a portrait of an American, Miss Ellen Hardin Walworth. Despite his new experience in Egypt and Algeria, Pearce chose to enter a portrait and not a work inspired by his journeys. By the next Salon Pearce had turned towards depicting historical scenes, most likely under the influence of Bonnat. He exhibited La Mort du Premier Né (Death of the First Born) at the Salon of 1877 and integrated eastern details, based on his first hand knowledge, into the composition. Though no longer an overwhelming popular or progressive subject with many artists, Pearce’s treatment of Biblical history was not surprising as “…from youth Pearce had wanted to be a religious painter of great Biblical subjects.” (Mary Lublin, A Rare Elegance: The Paintings of Charles Sprague Pearce, New York: The Jordan-Volpe Gallery, 1993, pg 11) Vis-à-vis the social and religious preoccupations of the Third Republic, this was fitting since France was zealously religious in an effort to regain religiosity in a period when it was threatened by secular modernity. Like many academic painters in an age of archaeological discoveries, Pearce has included artifacts for verisimilitude. According to an Egyptologist the partial wall painting above the mourners is derived from published illustrations of New Kingdom tomb paintings at Thebes, and the mummy case may be based on one in the Musée du Louvre in Paris…Lamentations nonetheless established Pearce’s reputation as a serious artist and was exhibited in New York City, Boston, Philadelphia, and Chicago. If the composition fails to demonstrate the artist’s knowledge of Egyptian art, its credible, if inaccurate, details provide the historical context coveted by Salon jurors and patrons alike. Pearce’s attempt to visualize a narrative recounted in the story of the Exodus exemplifies the nineteenth century’s fascination with authenticating the Bible. Pearce continued to exhibit biblical subjects at the Salons of 1879 (Le Sacrifice d’Abraham - The Sacrifice of Abraham) and 1881, receiving an honorable mention at the latter for Décollation de Saint Jean-Baptiste (Beheading of St. John the Baptist). This work was later shown at the Academy of Fine Arts in Pennsylvania where it received a first-place honor and was later sold to the Art Institute of Chicago – the work was subsequently deaccessioned. Not easily satisfied, Pearce took on yet another theme: the peasant, a theme that had a long and enduring history not only in the works of artists such as Jean-François Millet and Charles-François Daubigny, but also in France’s social history. An early peasant composition by Pearce was Porteuse D’eau (The Water-Carrier), for which he won a third-class medal at the 1883 Salon. In 1885 Pearce moved to Auvers-sur-Oise where he would remain the rest of his life and where he indulged his creativity by surrounding himself with nature. He exhibited Peines de Coeur (Troubles of the Heart) at the Salon that same year, a painting that was also shown at the Pennsylvania Academy where it won the Temple Gold medal for best figure painting. In the late 1880s Pearce continued his interest in peasant themes while also integrating pastoral paintings into his oeuvre. He remained a consistent yearly exhibitor at the Salon, in addition to participating in several international shows in Belgium, England, Germany, and America. The following years, beginning with his election to the jury of the Exposition Universelle of 1889, involved him in a number of ambitious activities which furthered his recognition, including chairing the Paris advisory committee for the World’ Columbian Exposition in Chicago in 1893 and the Paris Committee for the Louisiana purchase Exposition in St. Louis in 1904. 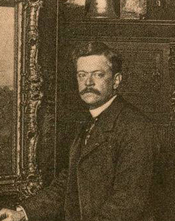 More importantly, he helped organize the first large scale American art exhibition in Belgium for the 1894 Antwerp World’s Fair. Even though Pearce adopted a style and subject matter preference that was typically French, it is clear that he was still interested in promoting the work of other American artists, especially those with a strong link to France. He was also named a Chevalier de la Légion d’Honneur in 1894. Pearce’s last Salon exhibition was in 1906 when he exhibited Jeune Picarde (Young Girl of Picardie). He died in Auvers-sur-Oise in 1914. The contribution of American artists, especially those working in a typical French manner, but in styles that were not as controversial as the incoming Impressionist group can often be overshadowed. Yet, in adopting these typically French representations, Charles Sprague Pearce spoke to a clientele and a public that appreciated his images specifically because they were in the same vein as many of the preceding artists of the nineteenth century. His work addressed the interest of the times, ranging from an obsession with the mid and far-East to the more socially driven goals in the depiction of the peasant. Pearce had fully immersed himself in the life and artistic culture of Paris and gained acclaim while maintaining his support for other American artists and exhibitions. Other international accolades for the artist include: Chevalier, Order of King Leopold, Belgium (1895); Vice President and founding member of The Paris Society of American Painters and Chevalier, Order of Red Eagle, Prussia (1897); Chevalier, Order of Red Eagle, Denmark (1898); Associate National Academician, National Academy of Design, New York (1906); and posthumously promoted to National Academician of the National Academy of Design; New York (1920).